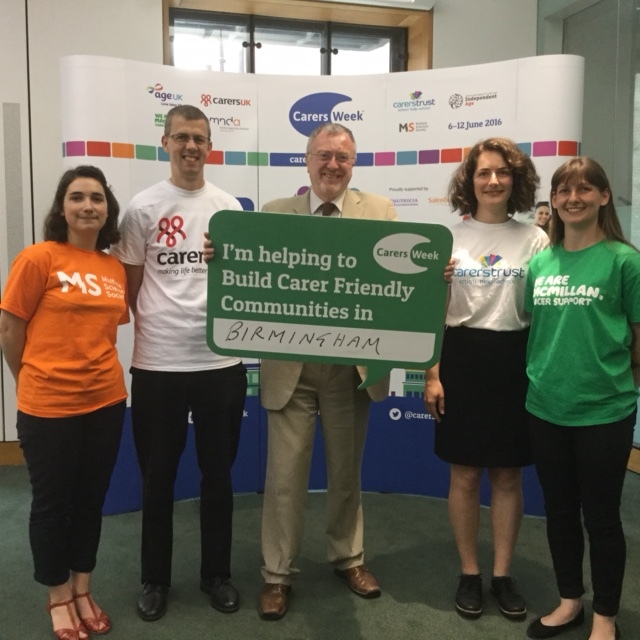 Yesterday I pledged my support for Carers Week 2016. Across the UK there are 6.5m people providing unpaid care for an ill, older or disabled family member or friend, with 11,243 of those in Birmingham Northfield. There are also a lot of people who do not identify themselves as carers because they see what they do as part and parcel of family life, helping to support those closest to them when they need help. Carers Week – running from 6th-12th June – is an annual campaign to raise awareness of these individuals and caring as a whole, while highlighting the challenges they face and recognising the contribution they make to families and communities throughout the UK. The campaign is calling on people to help improve the lives of carers by building ‘Carer Friendly Communities’ to encourage people to think about carers and do things differently to support them. The job of carers is of huge importance and what they do is life-changing. However, the support they provide is often hidden, unrecognised and not well understood. At yesterday’s Carers’ Week event in the House of Commons I met two people who each have close family members with Multiple Sclerosis. Their caring responsibilities do not come on a pre-prepared plan. The effects of MS are intermittent, but when they happen, they happen. The two people I met told me about the importance of carers’ employers being sensitive and responsive to this. That includes thinking about the “little things” – like one manager passing on information to other managers so the organisation as a whole can respond appropriately rather than inconsistently. 3 in 4 carers feel that their caring role isn’t understood or valued by their community and 2 in 3 say that lack of community support makes their job harder. 71% of them have experienced stress, anxiety and depression themselves while providing care for others. The understanding and the practical support we give can and does make a difference. These are just some of the reasons why I have given my support to Carers Week.